EVER SINCE THE late nineteenth century, when The New York Times first sent reporters deep into its dingy streets, the Lower East Side has made good copy. No other Manhattan neighborhood, with the possible exception of Harlem, has sustained as much attention as this one square mile of urban real estate. Uptown journalists, their curiosity in full swing, cautiously ventured downtown in the 1880s and 1890s to take the measure of America’s very first “great ghetto.” A galaxy of well-intentioned and well-heeled social missionaries accompanied them. One of their number, Minnie Louis, an “uptown Jewess of pleasing personality,” wrote at great length and with deep passion of her dismay at the “three Ds”—“dirt, disease and discomfort”—which held “high carnival” in that neck of the woods. Not content with simply jotting down her impressions, she sought actively to improve the lot of the ghetto’s Jewish immigrants by familiarizing them with the “cleansing properties of water” and the pleasures of oatmeal cookies. It will come as no surprise to learn that Minnie Louis of the East Fifties did not make much headway with the Jews of the East Side. Photographers in pursuit of colorful material were not far behind her. Jacob Riis, the celebrated author of How the Other Half Lives, was but the first of many shutterbugs who, well into the 1940s, found the immigrant enclave an unending source of visual interest. Many of America’s leading photographers of the interwar years cut their eye teeth on the Lower East Side, tilting their cameras this way and that in search of an arresting detail, a moment of pathos, an unfamiliar gesture. Time and again, what drew journalists, do-gooders, and photographers to this decidedly unlovely neighborhood—which most Jews abandoned as soon as they could—was the haunting, unsettling way in which it figured as a character in its own right: simultaneously at one with and apart from the urban metropolis whose grid (but little else) it shared. Everything about the place—its architecture, its rhythms, its residents—seemed at odds with the rest of the city. It still does. A veritable hipster haven, an epicenter of cool, as well as the site of a thriving Chinatown, the Lower East Side continues to march to its own beat. Jonathan Boyarin’s deeply felt account of the summer he spent a few years ago tending to the needs of an embattled little shul in the heart of the Lower East Side contributes handsomely to that perspective. Uptown New York’s synagogues (for the most part) are beautifully tended, abundantly funded, and well-oiled; downtown, they are a mess. Quite literally, too: at the time, the Stanton Street synagogue to which Boyarin belonged had no permanent rabbi, a dwindling membership, and a building that was falling apart at the seams. It was every writer’s dream. Boyarin, an anthropologist and ethnographer, makes the most of his subject. Whether describing the cranky, elderly congregants who comprise the morning minyan (prayer service), or the nasty intramural politics that are its engine, he draws us in and makes us care about the fate of a synagogue whose origins date back to 1913. His book endows the practice of salvage anthropology with new meaning. 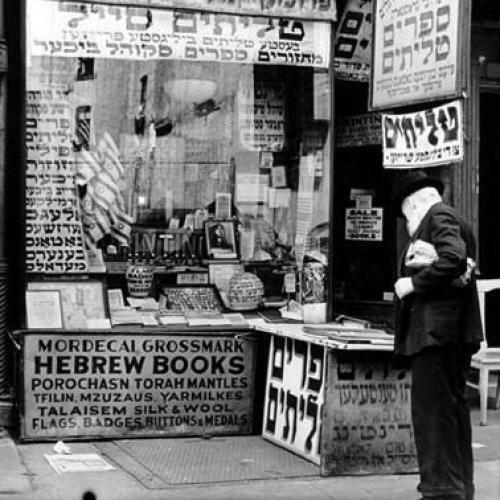 Religious institutions such as the Stanton Street shul, or Anshei Brzezan, to use its official name, were once a dime a dozen on the Lower East Side, where they were known as landsmanshaftn synagogues. Bound by geography and language, immigrants from the same hometown in Eastern Europe (Brzezany, say) gathered together to pray, socialize, reminisce, and assuage the loneliness of being so very far from home. Even the walls bore witness to what was lost in the transition from the Old World to the New. Some immigrants, drawing on the conventions of an age-old vernacular aesthetic, made a point of brightening their otherwise drab surroundings by painting mazoles, or zodiac signs that corresponded to the months of the Jewish calendar. The Stanton Street shul abounds in these sprightly images. A pair of lovebirds perched atop a tree welcomes the month of Sivan; a gimlet-eyed fish ushers in Adar while a lobster (a lobster!) signals the advent of the summer month of Tammuz. Modest and unassuming, much like its congregants, the downtown synagogue had few of the amenities that contemporary American Jews would come to expect from their houses of worship. The Stanton Street shul was no exception. In lieu of a social hall, the congregation rearranged the furniture in its sanctuary to make room for “collations,” where herring rather than sushi was the bill of fare. There was no vestry room to speak of, the bathrooms left a lot to be desired, and classrooms in which to transmit the tradition to a new generation were in scant supply. (So, too, were children to fill them.) Even the charming mazoles were fading fast, the paint peeling away from the wall in scads. Boyarin wouldn’t have it any other way. Sure, he would like to preserve the wall paintings, and stabilize the congregation’s finances, and crowd its wooden benches with worshippers. But in all other respects, this longtime resident of the Lower East Side and committed shul-goer is content with the way things are. He much prefers the rough and tumble, the easy familiarity, the improvisational qualities of his downtown shul to the grand, polished, preening temples which other American Jews frequent on occasion. “There does seem to be some kind of magic about the place,” he freely acknowledges. Even so, sadness suffuses the narrative, rendering it a bit of a slog. A litany of loss, the book woefully documents the erasure of what once was a kingdom of Jewishness. “On Houston Street … the Crown Delicatessen, Kosher, with a sign that spelled out in Hebrew letters “strictly kosher delicatessen,” gone; Ben’s Cheese Shop, kosher, with its specialty baked farmer cheeses (pineapple, blueberry, plain… ) gone; an outlet of Moise’s Bakery, kosher, gone … On Eldridge Street, just about everything Jewish gone.” Cataloging these casualties, as well as those within the more immediate precincts of the Stanton Street community, takes its toll on the author, who admits to growing tired of keeping this ship afloat. “What is it we are trying desperately to hold on to?” he asks. Boyarin’s carefully tended chronicle takes its toll on its audience, too. This is not a book to which one eagerly repairs, despite its lucid prose and sharp insights. Readers will soon grow weary of turning its pages, especially when, midway through, they come to the stark realization that no happy ending awaits. In the absence of a silver lining, of an angel hovering in the wings, we take our leave of the Stanton Street shul and its Lower East Side environs wondering whether they will live on as more than sweet memories. Jenna Weissman Joselit, the Charles E. Smith Professor of Judaic Studies & Professor of History at The George Washington University, blogs at www.fromunderthefigtree.com.